Need another copy of the Rapid Revenue Recovery Checklist? This checklist outlines the steps needed to quickly and properly follow up on your old insurance accounts receivable. Using our powerful system will have you bringing in more revenue on no time. 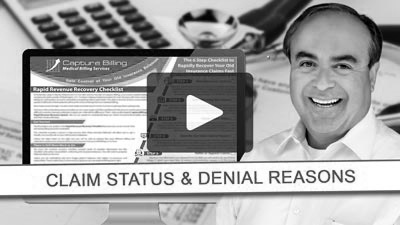 In this video, I cover steps 1 and 2 of the Rapid Revenue Recovery Checklist you downloaded so that you are clear on how to get your insurance accounts receivable under control. I will show you the reports you need to run to find out which insurance claims are outstanding, how old the claims are, and the dollar amount that remains uncollected. Then, we will come up with a plan on how to work the insurance claims in a way that will get you paid the biggest reimbursements faster. Look in your email for Video 2 tomorrow where I will walk you through Steps 3 and 4 of the Rapid Revenue Recovery Checklist. I will cover checking claims status and identifying the claim denial reason.